Want to put aside the ways of the city and enjoy a more rustic lifestyle? You might want to consider living in the Pine Barrens of southern New Jersey. Want your rustic life to have all the trappings of civilization still? 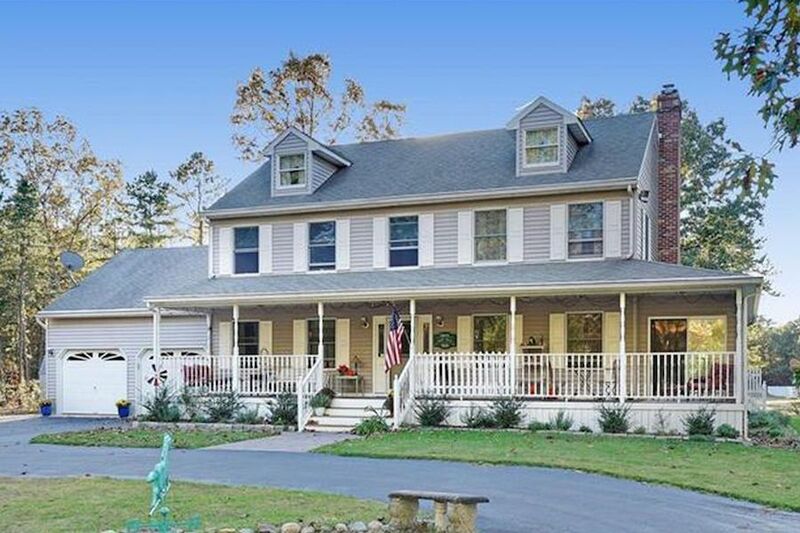 Check out these five homes within the boundaries of the Pinelands National Reserve. The homes featured here combine all the creature comforts you expect with great natural settings. And at least two of them have enough land for you to farm if you are so inclined. 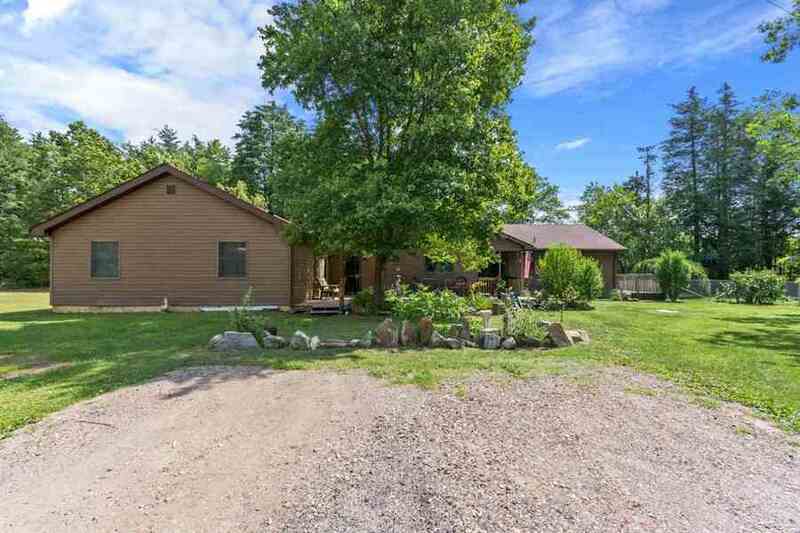 This Sixties rancher sits on nearly 30 acres of pristine land and has its own lake, views of which you can enjoy from its rear deck. Inside, there’s lots of room to stretch out, to entertain your family and friends in style, and to store your stuff. There’s also a handicapped-accessible in-law suite. A 1994 renovation has brought everything inside up to snuff, and its location in the portion of Hammonton that’s zoned for agricultural use means that you could try your hand at farming if you so desire. Since blueberry muck has been detected in the soil deposited in the nearby waterway, may we suggest that crop? Jersey blueberries are the best. The lot may be subdividable. This home’s sale price was reduced by $25,500 on May 30th. This home’s sale price was reduced by $25,900 on April 15th. If you keep your eyes peeled for a “builder’s special,” you can stop looking now, for this home is a “builder’s special” like no other. For starters, the builder built it as their own residence, and its location should make why abundantly clear. 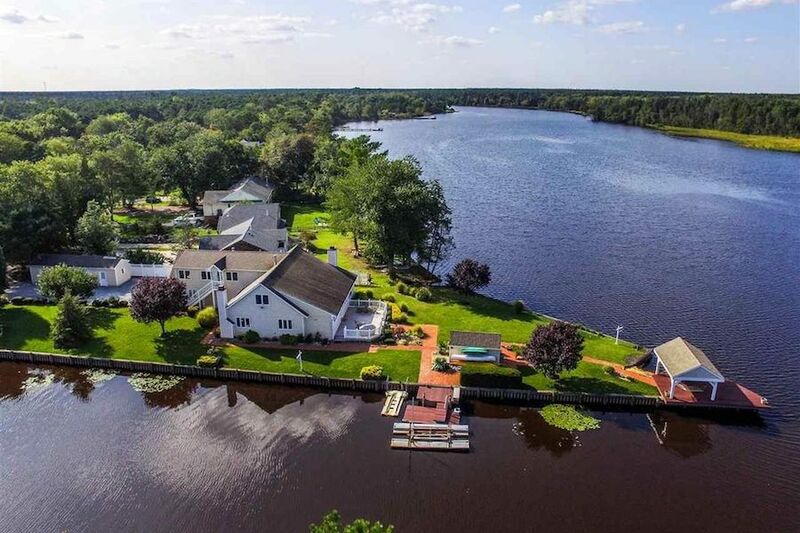 Your new home sits where a canal meets the Mullica River, and you have waterside frontage with bulkheads on both. You can dock your boats on the canal-side dock or relax in your hammock under the gazebo on the deck at the very tip of this lot. Inside, it’s loaded with extras like a central vacuuming system and a whirlpool tub in the master suite. There’s also a deck that looks out upon the water. There’s room to put in an in-law or home office suite too. 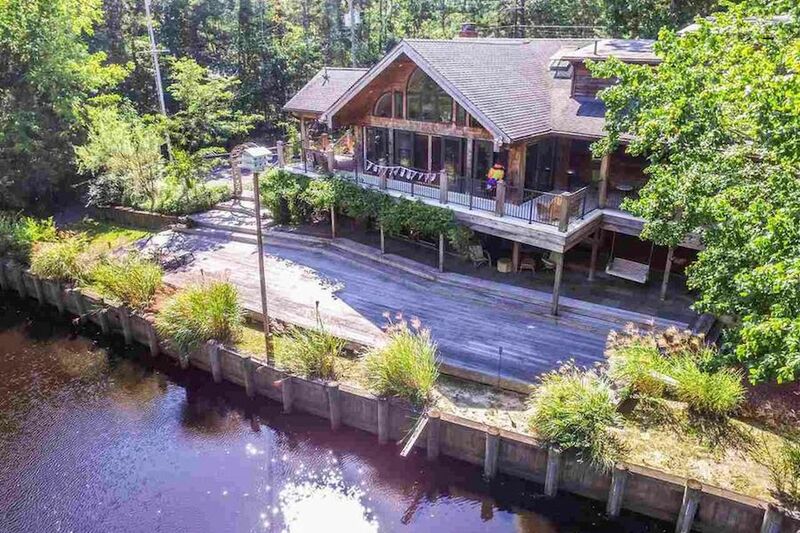 This huge custom contemporary home also sits right by the Mullica River, and the water is deep enough at your bulkhead for you to dock your boat. Lots of large windows and skylights flood the main floor living spaces with light and offer you fabulous views of the river. The soaring main-floor great room has a full-height stone fireplace, and there’s another fireplace in one of the three downstairs bedrooms. You can entertain your guests from either the large main floor deck or the one that’s by the water, and the upper-floor bedrooms have their own balconies as well. And if all this deckage isn’t enough for you, the Sweetwater Marina and Riverdeck outdoor bar and grill is a mere two miles away. What you see above is not your new home but a builder’s model — specifically, Paparone Builders’ “Brandywine” model at Hidden Creek, a new luxury residential development a two-minute drive south of historic Medford Village. Medford Village, settled in 1762, is one of the oldest extant settlements in the Pines, and its center is filled with unique shops, boutiques, restaurants, cafés and an arts center. As for what your new home will look like? 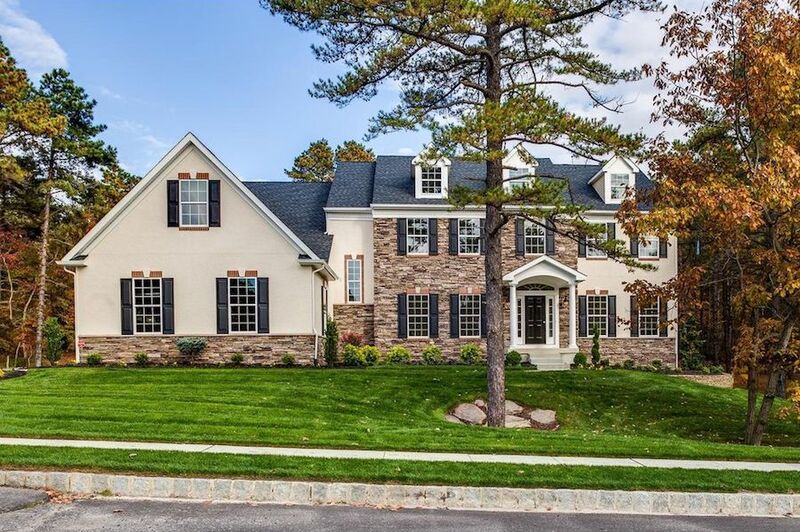 You can tell the nice Paparone sales representatives what you want it to look like: they offer several different elevations in this handsome Colonial model home, and they’ll customize it inside and out to your specifications. We can at least tell you that it has a cathedral ceiling in its morning room, a 12-foot-high one in its family room, and several places where you can put a fireplace.